One of the big misconceptions about Dirndl and Lederhosen outfits is that they are German national dress: they’re not. They’re Bavarian dress. If that seems like splitting hairs, remember that Germany is a country of over 80 million people, of which less than a quarter live in Bavaria. In fact, to many Germans, it’s a mystery as to why so many English-speakers have alighted on typically Bavarian things like lederhosen, dirndls, large measures of beer and copious consumption of pork products to represent their country – rather like taking Scotland to be the United Kingdom or the Deep South to be the whole of the USA. Nevertheless, Bavarians have absolutely no problem with being the face of Germany to the world. The fact that Munich is swimming ever September with Oktoberfest tourists who like the look of the traditional lederhosen and dirndl dress – or “Tracht” as it is called in German – is something that the average Bavarian is proud of. After all, as far as the Bavarians are concerned, the rest of Germany isn’t doing it right. That has to do with the proud history of Bavaria as a kingdom, which in turn engendered a distinct culture which has lasted to this day. After all, there has been an entity called Bavaria based around the Munich area since 555 A.D., while a country called Germany with Berlin as capital was not founded until 1871. The fact that this country called Germany has always been governed from an upstart a few hundred miles to the North is something that Bavarians have never been able to warm to – especially given the difficulties of German history in the twentieth century, during which Bavarians were quick to see the problems as coming from Berlin (even when the exact opposite was the case). Bavarians like to eat and drink their traditional food with their colours – blue and white, said to represent the summer sky – in full view on the table. Even today, in the peaceful and successful country that is modern Germany, Bavarians feel deeply that empires and states come and go, but that Bavaria as a country or a region will always be there to give them their identity. This is one reason why they have hung on to their (very strong) dialect, unique culinary culture, and of course lederhosen and dirndl costumes through to the present day. The persistence of traditional clothing and customs – which of course existed, but have died out in other parts of Germany and Europe – also has a lot to do with the Bavarian state of mind. Without generalising too wildly, it is safe to say that Bavarians tend to be sure of themselves, proud, even stubborn. 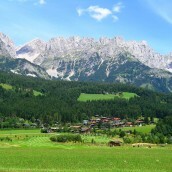 While other parts of Germany have historically looked to other cultures and languages (especially French and English) for inspiration, Bavaria has cultivated its own dialect – in the countryside, especially, where holdings are still passed down in families (and remain far smaller than the big agro-industrial farms of the North). Germany in general is interested in the new; Bavaria is often happier with the old. On the other hand, despite what some might think, Bavarians are not by and large arrogant or dismissive of outsiders due to their pride in their own culture. In fact, it precisely their pride that makes them happy to come to contact with people from other places – providing that they are no adverse to learning something about Bavaria. They are also very comfortable with modern technology and love the way it allows them to communicate with the rest of the world – both in business and in personal life – and this future-looking approach has made them Germany’s wealthiest region over the last thirty years. So when you visit Bavaria at the Oktobefest, you’ll see what German economists call the “laptop and lederhosen model” – iPhones lying next to tankards of beer. And the Oktoberfest is the place where the very best Bavarian characteristic is in full display: the love of good food and drink in a friendly, matey atmosphere and a good, old-fashioned knees up.